This topic is intended as a reference for Windows Presentation Foundation (WPF) application developers who are looking for ways to improve the performance of their applications. If you are a developer who is new to the Microsoft .NET Framework version 3.0 and WPF, you should first familiarize yourself with both platforms. This topic assumes working knowledge of both, and is written for programmers who already know enough to get their applications up and running. Information in this topic is based on version 1.0 of WPF. The performance data provided in this topic are based on WPF applications running on a 2.8 GHz PC with 512 RAM and an ATI Radeon 9700 graphics card. The success of achieving your performance goals depends on how well you develop your performance strategy. Planning is the first stage in developing any product. The following are a few very simple rules for developing a good performance strategy. Scenarios can help you focus on the critical components of your application. Scenarios are generally derived from your customers, as well as competitive products. Always study your customers and find out what really makes them excited about your product, and your competitors' products. Your customers' feedback can help you to determine your application's primary scenario. For instance, if you are designing a component that will be used at startup, it is likely that the component will be called only once, when the application starts up. Startup time becomes your key scenario. Other examples of key scenarios could be the desired frame rate for animation sequences, or the maximum working set allowed for the application. Goals help you to determine whether an application is performing faster or slower. You should define goals for all of your scenarios. All performance goals that you define should be based on your customers' expectations. It may be difficult to set performance goals early on in the application development cycle, when there are still many unresolved issues. However, it is better to set an initial goal and revise it later than not to have a goal at all. Always maintain the cycle of measuring, investigating, refining/correcting during your application development cycle. From the beginning to the end of the development cycle, you need to measure your application's performance in a reliable, stable environment. You should avoid variability caused by external factors. For example, when testing performance, you should disable anti-virus or any automatic update such as SMS, in order not to impact performance test results. Once you have measured your application's performance, you need to identify the changes that will result in the biggest improvements. Once you have modified your application, start the cycle again. You should know the relative cost of each feature you will use. For example, the use of reflection in Microsoft .NET Framework version 3.0 is generally performance intensive in terms of computing resources, so you would want to use it judiciously. This does not mean to avoid the use of reflection, only that you should be careful to balance the performance requirements of your application with the performance demands of the features you use. A key technique for creating a scalable approach towards achieving WPF application performance is to build towards graphical richness and complexity. Always start with using the least performance intensive resources to achieve your scenario goals. Once you achieve these goals, build towards graphic richness by using more performance intensive features, always keeping your scenario goals in mind. Remember, WPF is a very rich platform and provides very rich graphic features. Using performance intensive features without thinking can negatively impact your overall application performance. 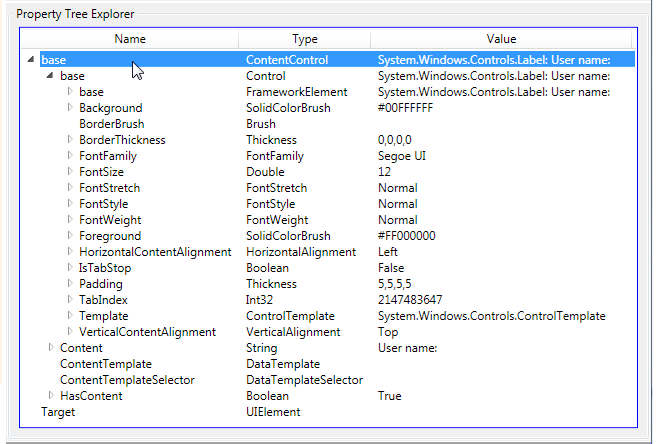 WPF controls are inherently extensible by allowing for wide-spread customization of their appearance, while not altering their control behavior. By taking advantage of styles, data templates, and control templates, you can create and incrementally evolve a customizable user interface (UI) that adapts to your performance requirements. The Photo Store Demo illustrates how you can easily create a separation between the basic user interface (UI) and the logic of the application. Once you have created this separation, if gives you the option of building towards graphical richness. The internal architecture of WPF has two rendering pipelines, hardware and software. One of the most important factors in determining WPF performance is that it is render bound—the more pixels you have to render, the greater the performance cost. However, the more rendering that can be offloaded to the graphics processing unit (GPU), the more performance benefits you can gain. The WPF application hardware rendering pipeline takes full advantage of Microsoft DirectX features on hardware that supports a minimum of Microsoft DirectX version 7.0. Further optimizations can be gained by hardware that supports Microsoft DirectX version 7.0 and PixelShader 2.0+ features. The WPF software rendering pipeline is entirely CPU bound. WPF takes advantage of the SSE and SSE2 instruction sets in the CPU to implement an optimized, fully-featured software rasterizer. Fallback to software is seamless any time application functionality cannot be rendered using the hardware rendering pipeline. The biggest performance issue you will encounter when rendering in software mode is related to fill rate, which is defined as the number of pixels that you are rendering. If you are concerned about performance in software rendering mode, try to minimize the number of times a pixel is redrawn. For example, if you have an application with a blue background, which then renders a slightly transparent image over it, you will render all of the pixels in the application twice. As a result, it will take twice as long to render the application with the image than if you had only the blue background. It may be very difficult to predict the hardware configuration that your application will be running on. However, you might want to consider a design that allows your application to seamlessly switch features when running on different hardware, so that it can take full advantage of each different hardware configuration. To achieve this, WPF provides functionality to determine the graphics capability of a system at runtime. Graphics capability is determined by categorizing the video card as one of three rendering capability tiers. WPF exposes an API that allows an application to query the rendering capability tier. Your application can then take different code paths at run time depending on the rendering tier supported by the hardware. The pixel shader, vertex shader, and multitexture features are used to define specific DirectX version levels, which, in turn, are used to define the different rendering tiers in WPF. Rendering Tier 0 No graphics hardware acceleration. The DirectX version level is less than version 7.0. Rendering Tier 1 Partial graphics hardware acceleration. The DirectX version level is greater than or equal to version 7.0, and lesser than version 9.0. For more information on WPF rendering tiers, see Graphics Rendering Tiers. The design of your WPF application can impact its performance by creating unnecessary overhead in calculating layout and validating object references. For more information, see The Layout System. The term "layout pass" describes the process of measuring and arranging the members of a Panel-derived object's collection of children, and then drawing them onscreen. The layout pass is a mathematically-intensive process—the larger the number of children in the collection, the greater the number of calculations required. For example, each time a child UIElement object in the collection changes its position, it has the potential to trigger a new pass by the layout system. Because of the close relationship between object characteristics and layout behavior, it's important to understand the type of events that can invoke the layout system. Your application will perform better by reducing as much as possible any unnecessary invocations of the layout pass. The layout system completes two passes for each child member in a collection: a measure pass, and an arrange pass. Each child object provides its own overridden implementation of the Measure and Arrange methods in order to provide its own specific layout behavior. At its simplest, layout is a recursive system that leads to an element being sized, positioned, and drawn onscreen. A child UIElement object begins the layout process by first having its core properties measured. The object's FrameworkElement properties that are related to size, such as Width, Height, and Margin, are evaluated. Panel-specific logic is applied, such as the Dock property of the DockPanel, or the Orientation property of the StackPanel. Content is arranged, or positioned, after all child objects have been measured. The collection of child objects is drawn to the screen. A child object is added to the collection. A LayoutTransform is applied to the child object. The UpdateLayout method is called for the child object. When a change occurs to the value of a dependency property that is marked with metadata affecting the measure or arrange passes. The complexity of the layout process is directly based on the layout behavior of the Panel-derived elements you use. For example, a Grid or StackPanel control provides much more functionality than a Canvas control. The price for this greater increase in functionality is a greater increase in performance costs. However, if you do not require the functionality that a Grid control provides, you should use the less costly alternatives, such as a Canvas or a custom panel. For more information, see Panels Overview. You may be able to update a Transform rather than replacing it as the value of a RenderTransform property. This is particularly true in scenarios that involve animation. By updating an existing Transform, you avoid initiating an unnecessary layout calculation. The construction of objects, particularly at run time, can affect the performance characteristics of your application. When a node is added or removed from the logical tree, property invalidations are raised on the node's parent and all its children. As a result, a top-down construction pattern should always be followed to avoid the cost of unnecessary invalidations on nodes that have already been validated. The following table shows the difference in execution speed between building a tree top-down versus bottom-up, where the tree is 150 levels deep with a single TextBlock and DockPanel at each level. The following code example demonstrates how to create a tree top down. For more information on the logical tree, see Element Tree. WPF provides a wide range of 2D graphics and imaging functionality that can be optimized for your application requirements. For more information on StreamGeometry objects, see How to: Create a Shape Using a StreamGeometry. // of the original size. Understanding the intrinsic behavior of WPF objects will help you make the right tradeoffs between functionality and performance. The delegate that an object passes to its event is effectively a reference to that object. Therefore, event handlers can keep objects alive longer than expected. When performing clean up of an object that has registered to listen to an object's event, it is essential to remove that delegate before releasing the object. Keeping unneeded objects alive increases the application's memory usage. This is especially true when the object is the root of a logical tree or a visual tree. WPF introduces a weak event listener pattern for events that can be useful in situations where the object lifetime relationships between source and listener are difficult to keep track of. Some existing WPF events use this pattern. If you are implementing objects with custom events, this pattern may be of use to you. For details, see WeakEvent Patterns. There are several tools, such as the CLR Profiler and the Working Set Viewer, that can provides information on the memory usage of a specified process. The CLR Profiler includes a number of very useful views of the allocation profile, including a histogram of allocated types, allocation and call graphs, a time line showing garbage collections of various generations and the resulting state of the managed heap after those collections, and a call tree showing per-method allocations and assembly loads. For more information, see Microsoft .NET Framework Developer Center. The Working Set Viewer is a WPF performance analysis tool that provides information on the memory usage of a specified process. This tool allows you to generate a snapshot of application memory usage information at a particular application state. For more information on WPF performance tools, see Performance Profiling Tools for WPF. In general, accessing a dependency property of a DependencyObject is not slower than accessing a CLR property. While there is a small performance overhead for setting a property value, getting a value is as fast as getting the value from a CLR property. Offsetting the small performance overhead is the fact that dependency properties support robust features, such as data binding, animation, inheritance, and styling. For more information, see Dependency Properties Overview. You should define dependency properties in your application very carefully. If your DependencyProperty affects only render type metadata options, rather than other metadata options such as AffectsMeasure, you should mark it as such by overriding its metadata. For more information about overriding or obtaining property metadata, see Dependency Property Metadata. It may be more efficient to have a property change handler invalidate the measure, arrange, and render passes manually if not all property changes actually affect measure, arrange, and render. For instance, you might decide to re-render a background only when a value is greater than a set limit. In this case, your property change handler would only invalidate render when the value exceeds the set limit. By default, registered dependency properties are non-inheritable. However, you can explicitly make any property inheritable. While this is a useful feature, converting a property to be inheritable impacts performance by increasing the length of time for property invalidation. While calling RegisterClassHandler allows you to save your instance state, it is important to be aware that the handler is called on every instance, which can cause performance problems. Only use RegisterClassHandler when your application requires that you save your instance state. When creating a DependencyProperty that requires a default value, set the value using the default metadata passed as a parameter to the Register method of the DependencyProperty. Use this technique rather than setting the property value in a constructor or on each instance of an element. When creating a DependencyProperty, you have the option of setting the PropertyMetadata using either the Register or OverrideMetadata methods. Although your object could have a static constructor to call OverrideMetadata, this is not the optimal solution and will impact performance. For best performance, set the PropertyMetadata during the call to Register. A Freezable is a special type of object that has two states: unfrozen and frozen. Freezing objects whenever possible improves the performance of your application and reduces its working set. For more information, see Freezable Objects Overview. Each Freezable has a Changed event that is raised whenever it changes. However, change notifications are costly in terms of application performance. By default, WPF provides an event handler for the SolidColorBrush object's Changed event in order to invalidate the Rectangle object's Fill property. In this case, each time the SolidColorBrush has to fire its Changed event it is required to invoke the callback function for each Rectangle—the accumulation of these callback function invocations impose a significant performance penalty. In addition, it is very performance intensive to add and remove handlers at this point since the application would have to traverse the entire list to do so. If your application scenario never changes the SolidColorBrush, you will be paying the cost of maintaining Changed event handlers unnecessarily. Freezing a Freezable can improve its performance, because it no longer needs to expend resources on maintaining change notifications. The table below shows the size of a simple SolidColorBrush when its IsFrozen property is set to true, compared to when it is not. This assumes applying one brush to the Fill property of ten Rectangle objects. // Create a Rectangle using a non-frozed Brush. // Create a Rectangle using a frozed Brush. The delegate that an object passes to a Freezable object's Changed event is effectively a reference to that object. Therefore, Changed event handlers can keep objects alive longer than expected. When performing clean up of an object that has registered to listen to a Freezable object's Changed event, it is essential to remove that delegate before releasing the object. WPF also hooks up Changed events internally. For example, all dependency properties which take Freezable as a value will listen to Changed events automatically. The Fill property, which takes a Brush, illustrates this concept. In this case myBrush is still keeping myRectangle alive and will call back to it when it fires its Changed event. Note that assigning myBrush to the Fill property of a new Rectangle will simply add another event handler to myBrush. The recommended way to clean up these types of objects is to remove the Brush from the Fill property, which will in turn remove the Changed event handler. WPF also provides a variation of the StackPanel element that automatically "virtualizes" data-bound child content. In this context, the word virtualize refers to a technique by which a subset of UIElements are generated from a larger number of data items based upon which items are visible on-screen. It is intensive, both in terms of memory and processor, to generate a large number of UI elements when only a few may be on the screen at a given time. VirtualizingStackPanel (through functionality provided by VirtualizingPanel) calculates visible items and works with the ItemContainerGenerator from an ItemsControl (such as ListBox or ListView) to only create UIElements for visible items. As a performance optimization, visual objects for these items are only generated or kept alive if they are visible on the screen. When they are no longer in the viewable area of the control, the visual objects may be removed. This is not to be confused with data virtualization, where data objects are not all present in the local collection- rather streamed in as needed. The table below shows the elapsed time adding and rendering 5000 TextBlock elements to a StackPanel and a VirtualizingStackPanel. In this scenario, the measurements represent the time between attaching a text string to the ItemsSource property of an ItemsControl object to the time when the panel elements display the text string. WPF allows you to share application resources so that you can support a consistent look or behavior across similar-typed elements. For more information on resources, see Resources Overview. If your application uses custom controls and defines resources in a ResourceDictionary (or XAML Resources node), it is recommended that you either define the resources at the Application or Window object level, or define them in the default theme for the custom controls. Defining resources in a custom control's ResourceDictionary imposes a performance impact for every instance of that control. For example, if you have performance-intensive brush operations defined as part of the resource definition of a custom control and many instances of the custom control, the application's working set will increase significantly. To illustrate this point, consider the following. Let's say you are developing a card game using WPF. For most card games, you need 52 cards with 52 different faces. You decide to implement a card custom control and you define 52 brushes (each representing a card face) in the resources of your card custom control. In your main application, you initially create 52 instances of this card custom control. Each instance of the card custom control generates 52 instances of Brush objects, which gives you a total of 52 * 52 Brush objects in your application. By moving the brushes out of the card custom control resources to the Application or Window object level, or defining them in the default theme for the custom control, you reduce the working set of the application, since you are now sharing the 52 brushes among 52 instances of the card control. If you have multiple elements using the same Brush object, define the brush as a resource and reference it, rather than defining the brush inline in XAML. This method will create one instance and reuse it, whereas defining brushes inline in XAML creates a new instance for each element. A static resource provides a value for any XAML property attribute by looking up a reference to an already defined resource. Lookup behavior for that resource is analogous to compile-time lookup. A dynamic resource, on the other hand, will create a temporary expression during the initial compilation and thus defer lookup for resources until the requested resource value is actually required in order to construct an object. Lookup behavior for that resource is analogous to run-time lookup, which imposes a performance impact. Use static resources whenever possible in your application, using dynamic resources only when necessary. Using the Glyphs and GlyphRun objects directly. Using high-level controls, such as the TextBlock and FlowDocument objects. Windows Presentation Foundation (WPF) provides advanced text support including glyph-level markup with direct access to Glyphs for customers who want to intercept and persist text after formatting. These features provide critical support for the different text rendering requirements in each of the following scenarios. Screen display of fixed-format documents. Extensible Application Markup Language (XAML) as a device printer language. Previous printer drivers, output from Win32 applications to the fixed format. Fixed-format document representation, including clients for previous versions of Windows and other computing devices. Glyphs and GlyphRun are designed for fixed-format document presentation and print scenarios. Windows Presentation Foundation (WPF) provides several elements for general layout and user interface (UI) scenarios such as Label and TextBlock. For more information on layout and UI scenarios, see the Typography in Windows Presentation Foundation. The following examples show how to define properties for a Glyphs object in Extensible Application Markup Language (XAML). The Glyphs object represents the output of a GlyphRun in XAML. The examples assume that the Arial, Courier New, and Times New Roman fonts are installed in the C:\WINDOWS\Fonts folder on the local computer. If you have custom control and you want to render glyphs, use the DrawGlyphRun method. WPF also provides lower-level services for custom text formatting through the use of the FormattedText object. The most efficient way of rendering text in Windows Presentation Foundation (WPF) is by generating text content at the glyph level using Glyphs and GlyphRun. However, the cost of this efficiency is the loss of easy to use rich text formatting, which are built-in features of Windows Presentation Foundation (WPF) controls, such as TextBlock and FlowDocument. The FormattedText object allows you to draw multi-line text, in which each character in the text can be individually formatted. For more information, see Drawing Formatted Text. To create formatted text, call the FormattedText constructor to create a FormattedText object. Once you have created the initial formatted text string, you can apply a range of formatting styles. If your application wants to implement its own layout, then the FormattedText object is better choice than using a control, such as TextBlock. For more information on the FormattedText object, see Drawing Formatted Text . The FormattedText object provides low-level text formatting capability. You can apply multiple formatting styles to one or more characters. For example, you could call both the SetFontSize and SetForegroundBrush methods to change the formatting of the first five characters in the text. The following code example creates a FormattedText object and renders it. // Create the initial formatted text string. // Set a maximum width and height. If the text overflows these values, an ellipsis "..." appears. // Use a larger font size beginning at the first (zero-based) character and continuing for 5 characters. // The font size is calculated in terms of points -- not as device-independent pixels. // Use a Bold font weight beginning at the 6th character and continuing for 11 characters. // Use a linear gradient brush beginning at the 6th character and continuing for 11 characters. // Use an Italic font style beginning at the 28th character and continuing for 28 characters. // Draw the formatted text string to the DrawingContext of the control. WPF includes multiple controls for drawing text to the screen. Each control is targeted to a different scenario and has its own list of features and limitations. In general, the TextBlock element should be used when limited text support is required, such as a brief sentence in a user interface (UI). Label can be used when minimal text support is required. The FlowDocument element is a container for re-flowable documents that support rich presentation of content, and therefore, has a greater performance impact than using the TextBlock or Label controls. For more information on FlowDocument, see Flow Document Overview. The TextBlock element is derived from UIElement. The Run element is derived from TextElement, which is less costly to use than a UIElement-derived object. When possible, use Run rather than TextBlock for displaying text content in a FlowDocument. In general, using a Run within a TextBlock is more performance intensive than not using an explicit Run object at all. If you are using a Run in order to set text properties, set those properties directly on the TextBlock instead. The following table shows the cost of displaying 1000 TextBlock objects with and without an explicit Run. Imagine a scenario where you have a Label object that is updated frequently from a String source. When data binding the Label element's Content property to the String source object, you may experience poor performance. Each time the source String is updated, the old String object is discarded and a new String is recreated—because a String object is immutable, it cannot be modified. This, in turn, causes the ContentPresenter of the Label object to discard its old content and regenerate the new content to display the new String. The solution to this problem is simple. If the Label is not set to a custom ContentTemplate value, replace the Label with a TextBlock and data bind its Text property to the source string. The Hyperlink object is an inline-level flow content element that allows you to host hyperlinks within the flow content. A TextDecoration object is a visual ornamentation that you can add to text; however, it can be performance intensive to instantiate. If you make extensive use of Hyperlink elements, consider showing an underline only when triggering an event, such as the MouseEnter event. For more information, see How to: Use a Text Decoration with a Hyperlink. The following table shows the performance cost of displaying 1000 Hyperlink elements with and without an underline. WPF provides rich text formatting services, such as automatic hyphenations. These services may impact application performance and should only be used when needed. Automatic hyphenation finds hyphen breakpoints for lines of text, and allows additional break positions for lines in TextBlock and FlowDocument objects. By default, the automatic hyphenation feature is disabled in these objects. You can enable this feature by setting the object's IsHyphenationEnabled property to true. However, enabling this feature causes WPF to initiate Component Object Model (COM) interoperability, which can impact application performance. It is recommended that you do not use automatic hyphenation unless you need it. A Figure element represents a portion of flow content that can be absolutely-positioned within a page of content. In some cases, a Figure may cause an entire page to automatically reformat if its position collides with content that has already been laid-out. You can minimize the possibility of unnecessary reformatting by either grouping Figure elements next to each other, or declaring them near the top of content in a fixed page size scenario. The optimal paragraph feature of the FlowDocument object lays out paragraphs so that white space is distributed as evenly as possible. By default, the optimal paragraph feature is disabled. You can enable this feature by setting the object's IsOptimalParagraphEnabled property to true. However, enabling this feature impacts application performance. It is recommended that you do not use the optimal paragraph feature unless you need it. Windows Presentation Foundation (WPF) data binding provides a simple and consistent way for applications to present and interact with data. Elements can be bound to data from a variety of data sources in the form of CLR objects and XML. For more information on data binding, see Data Binding Overview. The source of a Windows Presentation Foundation (WPF) data binding can be any CLR object. You can bind to properties, sub-properties, or indexers of a CLR object. The binding references are resolved by using either Microsoft .NET Framework version 3.0 reflection or an ICustomTypeDescriptor. Here are three methods for resolving object references for binding. To a DependencyProperty of a DependencyObject. Consider a scenario in which you have a CLR List object that holds a list of employees that you want to display in a ListBox. To create a correspondence between these two objects, you would bind your employee list to the ItemsSource property of the ListBox. However, suppose you have a new employee joining your group. You might think that in order to insert this new person into your bound ListBox values, you would simply add this person to your employee list and expect this change to be recognized by the data binding engine automatically. That assumption would prove false; in actuality, the change will not be reflected in the ListBox automatically. This is because the CLR List object does not automatically raise a collection changed event. In order to get the ListBox to pick up the changes, you would have to recreate your list of employees and re-attach it to the ItemsSource property of the ListBox. While this solution works, it introduces a huge performance impact. Each time you reassign the ItemsSource of ListBox to a new object, the ListBox first throws away its previous items and regenerates its entire list. The performance impact is magnified if your ListBox maps to a complex DataTemplate. A very efficient solution to this problem is to make your employee list an ObservableCollection. An ObservableCollection object raises a change notification which the data binding engine can receive. The event adds or removes an item from an ItemsControl without the need to regenerate the entire list. The table below shows the time it takes to update the ListBox (with UI virtualization turned off) when one item is added. The number in the first row represents the elapsed time when the CLR List object is bound to ListBox element's ItemsSource. The number in the second row represents the elapsed time when an ObservableCollection is bound to the ListBox element's ItemsSource. Note the significant time savings using the ObservableCollection data binding strategy. If you have a choice between binding an IList or an IEnumerable to an ItemsControl object, choose the IList object. Binding IEnumerable to an ItemsControl forces WPF to create a wrapper IList object, which means your performance is impacted by the unnecessary overhead of a second object. When you use a Brush to set the Fill or Stroke of an element, it is better to set the Brush.Opacity value rather than the setting the element's Opacity property. Modifying an element's Opacity property can cause WPF to create a temporary surface. Each NavigationWindow object has a journal that records the user's navigation history in that window. One of the purposes of the journal is to allow users to retrace their steps. When you navigate using a uniform resource identifier (URI), the journal stores only the uniform resource identifier (URI) reference. This means that each time you revisit the page, it is dynamically reconstructed, which may be time consuming depending on the complexity of the page. In this case, the journal storage cost is low, but the time to reconstitute the page is potentially high. When you navigate using an object, the journal stores the entire visual tree of the object. This means that each time you revisit the page, it renders immediately without having to be reconstructed. In this case, the journal storage cost is high, but the time to reconstitute the page is low. When you use the NavigationWindow object, you will need to keep in mind how the journaling support impacts your application's performance. For more information, see Navigation Overview. Hit testing on large 3D surfaces is a very performance intensive operation in terms of CPU consumption. This is especially true when the 3D surface is animating. If you do not require hit testing on these surfaces, then disable hit testing. Objects that are derived from UIElement can disable hit testing by setting the IsHitTestVisible property to false. Whenever possible, avoid using the ScrollBarVisibility value Auto for the HorizontalScrollBarVisibility and VerticalScrollBarVisibility properties. These properties are defined for RichTextBox, ScrollViewer, TextBox objects, and as an attached property for the ListBox object. Instead, set ScrollBarVisibility to Disabled, Hidden, or Visible. The Auto value is intended for cases when space is limited and scrollbars should only be displayed when necessary. For example, it may be useful to use this ScrollBarVisibility value with a ListBox of 30 items as opposed to a TextBox with hundreds of lines of text. The Visual Profiler tool suite provides a rich, graphical view of performance data. 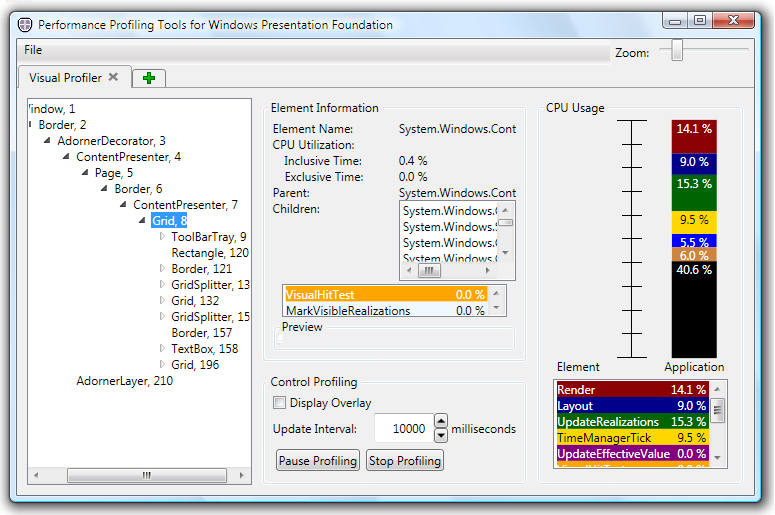 In this screenshot, the CPU Usage section of the Visual Profiler gives you a precise breakdown of an object's use of WPF services, such as rendering and layout. For more information on WPF performance tools, see Performance Profiling Tools for WPF. 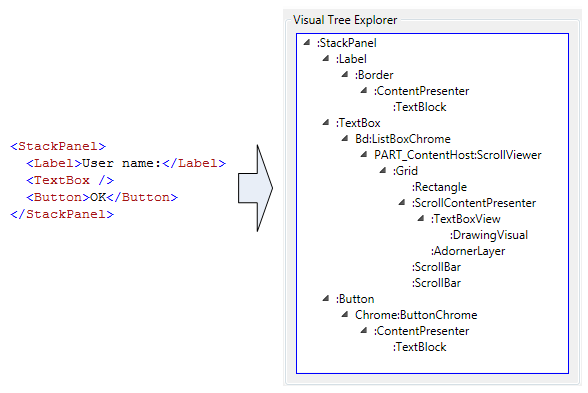 Analyzing the visual tree hierarchy using XAMLPad may give you insight into how control template expansion works. This knowledge may help you understand the performance costs and tradeoffs of the user interface design you are creating. Notice how the Label, TextBox, and Button controls each display a separate visual object hierarchy in the Visual Tree Explorer panel of XamlPad. This is because WPF controls have a ControlTemplate that contains the visual tree of that control. When you explicitly reference a control, you implicitly reference its visual hierarchy. For more information on visual objects and the visual tree, see Windows Presentation Foundation Graphics Rendering Overview. You can view the property settings of an item in the Visual Tree Explorer by selecting the item. The Property Tree Explorer panel, below the Visual Tree Explorer panel, displays the current property settings for the selected visual object. For more information, see XAMLPad. The PresentationTraceSources class provides debug tracing support that specifically targets Windows Presentation Foundation (WPF) applications. Tracing is a diagnostics system by which an application's progression can be tracked. The tracing statements report information, much the way the WriteLine method is often used. However, tracing statements can be switched on or off by using a configuration file. In addition, the output of tracing statements can be customized. For other related .NET Framework 3.0 diagnostic classes, see System.Diagnostics.